A canopy for the crib is not only very beautiful and comfortable, but also functional accessory. With it, you can close the crib from excess light and even protect the baby from mosquitoes. To purchase the valance at any baby store or points of sale of textile products where they are sold in sets with soft bumpers, a blanket and a pillow, but you can do with your hands. In order to secure the canopy on the crib, you need to buy a special tripod mount for it. The tripod consists of three pieces: straight tube, curved tube and a loop that fits over the canopy. The set included two tripod mounts. Before proceeding to attaching the canopy, assemble the tripod in full length and estimate at what altitude you would like it to fix. To do so, insert curved pipe in a straight line, put on top of the loop to the canopy and attach the tripod to one of the sides of the crib. Usually the canopy proveshivajut to one of the long sides of the bed – so if necessary you can put that over the whole bed completely. If to secure this accessory to the headboard, it will close part of the crib. Identifying the length, tighten the lower straight up on the bed with mounts and curved tube and a loop of clear. Consider the hinge for the canopy – it has a small elastic band. Remove it to thread the loop through the canopy. Now take the four poster bed and look carefully at its upper part. It has two "sleeves", one of which you need to thread the loop. If you put a loop at the bottom of the "sleeves", then on top of the canopy forms a beautiful frill, and if threaded in the upper casing will not. Threading the loop in one of the "arms" of the canopy, fasten the ends of the loop of the rubber band to distribute the gathers of the top ruffle. Then insert the loop in the curved tube, thread it through the bottom of the second pin and pull it straight up. Now firmly tighten and straighten the floors of the four-poster bed. 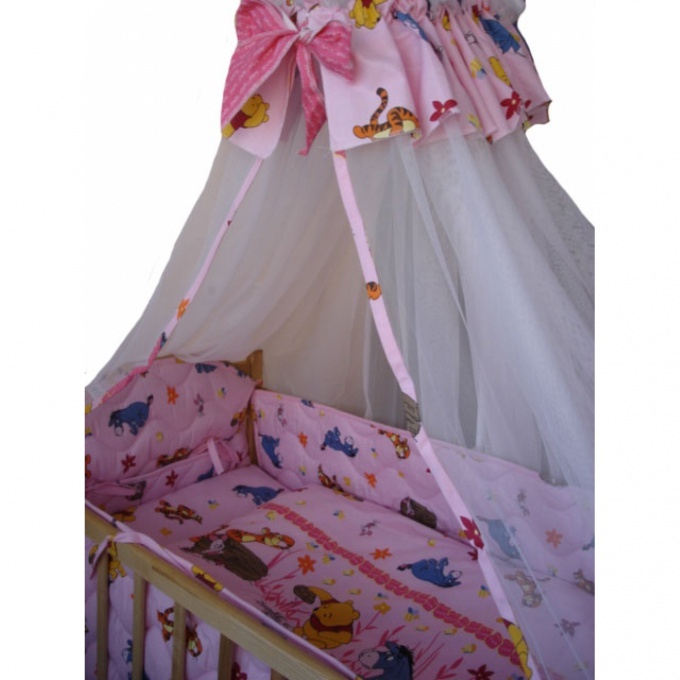 The canopy for your baby is ready. If you did everything correctly, the canopy will hang in the crib and won't fall down, even if the baby will try to pull off. Four-poster crib will look very elegant and cute, although some parents believe that baby it's not needed.